Before we get into this newest edition of Many Faces of Manny, I must give a tip of my hat to my buddy Rick Carpiniello over at Rangers Report, who is not only one of the finest journalists in the world but also a very funny and beautiful man who has either come up with or partaken in the development of some of the fine acronyms and made up words that will populate this rant. Without his dedication these genius terms, like NSML and “pansification” and “Europansy,” would never have been possible. That all being said, let’s get into this month’s topic: the Pansification of the NHL. Over the past year, my exposure to social media outlets such as Twitter has made me hip to a brilliant intersection between hockey and metal. Perhaps it’s because both provide a healthy, natural outlet for explosive anger and violence. Perhaps it’s because both are rather niche interests. For whatever reason, I have met some awesome people that love both music and hockey, and it is for them that I write this. 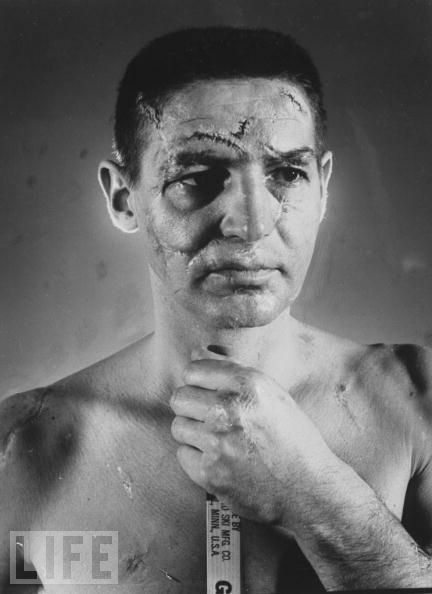 Terry Sawchuk took more than a few pucks and sticks to his face throughout his career. At the turn of the century it wasn’t uncommon for players to actually die on the ice due to complications resulting from injuries. Even great players like Bill Masterton, namesake of the Bill Masterton Memorial Trophy, gave their life for the sport they loved. I am not advocating for hockey to involve more brutal death (except for maybe a select few players), I’m just pointing out where the sport comes from. Before curved stick blades were common, goaltenders didn’t even wear masks. At all. They looked a lot like Terry Sawchuk. The NHL didn’t even require skaters to wear helmets until 1979 and even then still chose to grandfather in the clause. The NHL still doesn’t require visor protection unless you’re a rookie (although they are moving in that direction). While I’m not vehemently opposed to helmets, visors get under my skin. As Tanner Glass once said, “Visors are for soft guys and Europeans.” And I do not disagree at all. Despite the fact that visors are sometimes the cause of injuries, it severely cuts down on your ability to be a tough guy while hiding behind that piece of plexiglass. With the exception of Manny Malhotra, Marc Staal and others with severe eye injuries, I would like to see all players take off those windshields. Hockey has a history of players walking off substantial injuries, getting stitched on the bench and even having an insane amount of dental work done between periods only to come back out and play (e.g. Duncan Keith and Andrew Cogliano). In the most extreme of examples, Clint Malarchuk had his throat slit by a skate, received 300 stitches and missing only five games (about one week). That is a proud and storied history that should be celebrated and honored rather than looked at as a cautionary tale. It could be my heart condition resulting in some compensatory desire within me to associate with tough guys, or maybe it’s my grandfather’s influence after a harrowing experience in WWII (following a semi-pro hockey career and preceding a career as an oral surgeon). But what I think it is, mostly, is that I wholeheartedly respect people that love what they do and are willing to sacrifice anything for it. Hockey players are a prime example of that behavior. And, of course, they are paid handsomely for it, but they still lay it all on the line simply for the love of a game where the trophy actually means something. The NHL claims that they want to be serious about reducing head injuries and protecting players. Certainly the deaths of Rick Rypien, Derek Boogard, Steve Montador and Wade Belak raised questions about the delayed effects of the game (if you want to read more about how I would resolve concussions you can do so here). But the NHL went entirely in the wrong direction—they’ve actually threatened to remove fighting. 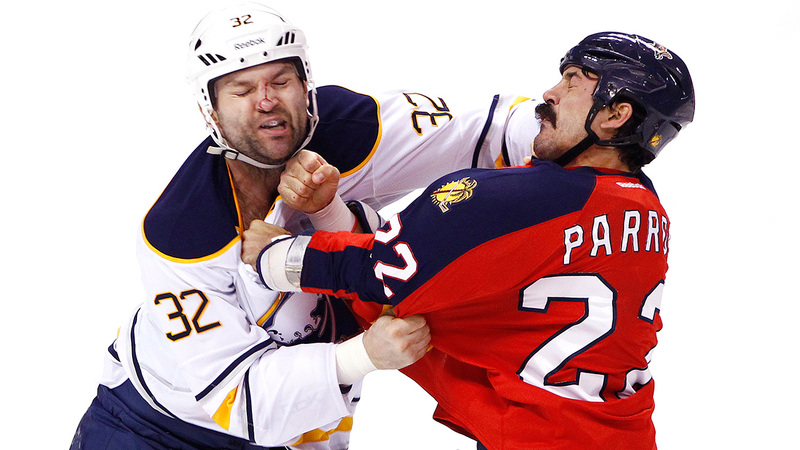 Fighting is not only an integral part of hockey; if you ask many hockey players they will tell you that the on-ice policing offered by fighting actually keeps the players safer than if fighting was removed. If you don’t believe me that fighting is a beloved part of the game just spend a few hours cruising around the genius that is Hockey Fights. But what do Commissioner Gary Bettman and the NHL do? 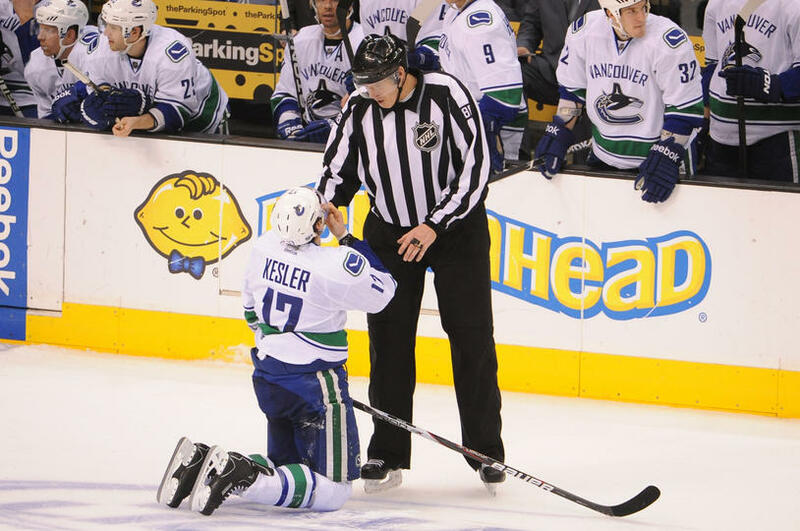 Two things that make me insane: (1) they develop the instigator penalty, which disallows a player from standing up for his teammate; and (2) they remove the instigator penalty for initiating a fight while wearing a visor. What kind of sissy stuff is this!? Hockey is a man’s sport. It’s supposed to make you tough. That’s the whole point. As Stevenson says in Goon, “get harder then them!” The Flyers (aka The Broad Street Bullies) and the Bruins (aka The Big Bad Bruins) made dynasties out of on-ice bullying. Heck, former Bruins coach (now opinionated hockey commentator) Mike Milbury once even beat a fan with his own shoe! Which brings us to the today’s NHL, better known as the NSML (National Sissy Mary League). With player suspensions rampant, the league has turned from tough to pathetic. Even the best player in the world, Sidney Crosby, has a reputation for whining to the referees. In fact, the entire Montreal Canadiens team is well known for not only their whining but also their penchant for faking injuries à la soccer players. So many players are faking it these days that a penalty had to be created in an effort to curb this behavior—which it has completely failed at doing. This is the type of behavior that would make tough hockey traditionalists like Bobby Orr throw up his fists in protest. Even hockey writers like Adam Proteau are seeking to destroy the game that we all love by removing fighting. Fights are down, enforcers have all but disappeared and former figure skaters, e.g. Jeff Skinner, have found their way onto NHL rosters. The NHL is in crisis mode. Great NHL enforcers like Eric Boulton, George Parros, Stu Bickel, Colton Orr and countless others found themselves playing in the AHL, KHL or sitting at home on the couch as these former big boys were unable to even get contracts from an NHL-level team. Teams chose to incorporate smaller, quicker players in their place with minor league players like Rocco Grimaldi (5’6″, 172lbs) receiving call ups. It’s not enough to say that hockey got smaller, because by and large the players individual height and weight has increased due to better strength training, but the play itself, the product that fans are forced to watch, has gotten softer. There’s less hitting, less fighting, less scrums and much more referee intervention. Nowadays any scrum on the ice is quickly dispersed and separated by the zebras and players are heavily penalized for any of the rough stuff. But in the rare occasion that two big boys are allowed to fight it out, the fans roar in approval. Even the announcers train their ability to call a good fight. It’s one of the most exciting moments in professional sports. The NHL and its affiliate leagues are the only hockey leagues in the world playing on sheets of ice that are 200′ x 85′. This creates a game where the action is tight, the bodies collide more often and to get through more crowded spaces you have to be tougher, harder and much more willing to take punishment. The rest of the world plays on Olympic size ice which is 200′ x 100′. If you’re not familiar with international play, you will have to trust me: the difference in width makes a huge difference. International competition has more in common with figure skating than it does with hockey. And if you’re looking in the softer European countries like Sweden and Norway, you can be sure that the players will be wearing full cages as they do in North American colleges. It’s a complete disregard and lack of respect for the over-100-year history of this fine sport. A kick to the onion sack of all those that died trying to get us to where we are today. The perfect hockey fan reps VG. And finally, the worst part is the trickle-down effect of this pansification. Leagues for children and teens are removing hitting from their games entirely. We are raising a generation of children that will not be ready for the harsh, wonderful realities of the NHL—children that won’t be ready to absorb a hit to make a play, and that will eventually make hockey utterly unwatchable. So please, call your local hockey club and encourage them to play the right way. The tough way. The only way. And please, remember to rock Violent Gentlemen (just like that super fan on the right) wherever you go and support OLD TIME HOCKEY!